Homepage » Crochet For Baby & Children » Baby Blankets » [Free Pattern] This Chunky Crochet Baby Blanket Is Such A Joy To Make! [Free Pattern] This Charizard Is Magnificent! This is such a lovely pattern and works up really fast! The Chunky Crochet Baby Blanket by Monica Chavez is just a simple single crochet blanket made using 3 strands of bulky yarn together. Looks amazing and complicated and if you know single crochet, you’ll be amazed how quickly you’ll fall in love with this pattern. If you don’t know how to do the single crochet, please watch the video tutorial on the next page. This thick afghan that can be used as a blanket makes also a perfect rug to lie on. The best part of this project is that you don’t have to count stitches. You can make your crochet project to whatever dimensions you are looking to have in a final product.Go ahead and follow the link to the next page for the video tutorial. 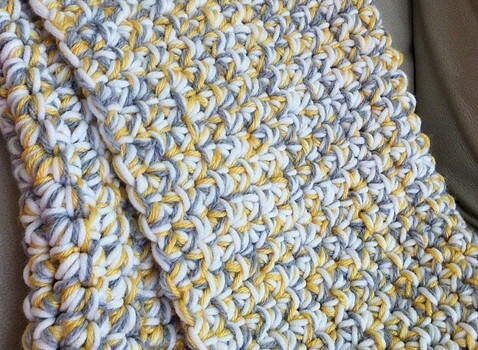 4 Comments to [Free Pattern] This Chunky Crochet Baby Blanket Is Such A Joy To Make! I just saw this on a fb page and thought it was so awesome that I had to share with you. Beautiful colors. That is one dedicated corcheter! Haha Sonia , this is awesome!! Thanks for sharing!